Which Miles 33 Solution Can Help You Most? Rapid change, caused by the web, the emergence of mobile devices and the wide adoption of social media, are forces that today’s newspapers have never faced before. Newspapers are fighting back, but their technology is often a limiting factor. This is where Miles 33’s Digital Generation of integrated applications can help. Whether you want to grow online audiences, sell web inventory, get close to your readers or monetize your mobile news apps . . . We have a solution for your publishing needs. Manage all your digital assets in one place. Whether you need access for day-to-day production, for research or just to peruse previously published content, you have direct access from your workstation or mobile device. 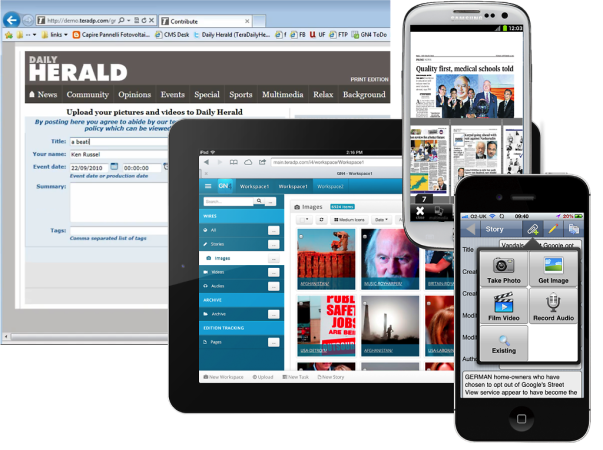 The perfect Cloud-Based WebCMS for newspapers, magazines and radio stations and news publishers. It is a complete and simple-to-use WebCMS that will put you at the forefront of digital publishing. Including CRM and Audience Analysis to grow your Digital, Mobile and Print ad revenues. A modular advertising business system for booking, contact management, advertisement sales, make-up and pricing. Self-service advertising portal solutions for classified, display and trade.